The whole concept of managing a project from start to finish requires a team/group of people with different talents & abilities. This select group of people are responsible for planning and executing the project objectives and that takes more than just labour and materials. Each project follows a project cycle or pathway. A good project plan can be the difference between success/failure & understanding the process involved. Each project follows a Life Cycle. Project Management (PM) helps define the plan and organise the process: Projects are naturally busy & a very demanding exercise. The main ambition of project management is to organise & plan projects to manage the process. Project management is a concise path mapped out from beginning to end that helps ensure the outcome meets the overall objectives. Establishes a time frame & actual tangible plan: Without a proper schedule, a project has a greater probability of delays, cost overruns & even failure. A proactive schedule is key to any successful project. Maximises available resources: Resources, whether financial or human, are expensive. By enforcing strong project management disciplines such as project tracking and risk management, all resources are used effectively. Helps encourage teamwork: A project inevitably brings people together to share ideas & provide leadership. Joint collaboration is the cornerstone to ensure effective project planning and management. Manages the mix: Projects don’t normally happen in isolation. They need to be integrated with ongoing business processes, systems & organizations. You can’t for example introduce a new system that doesn’t blend with your existing, ongoing business needs. Integration is often key to project value. 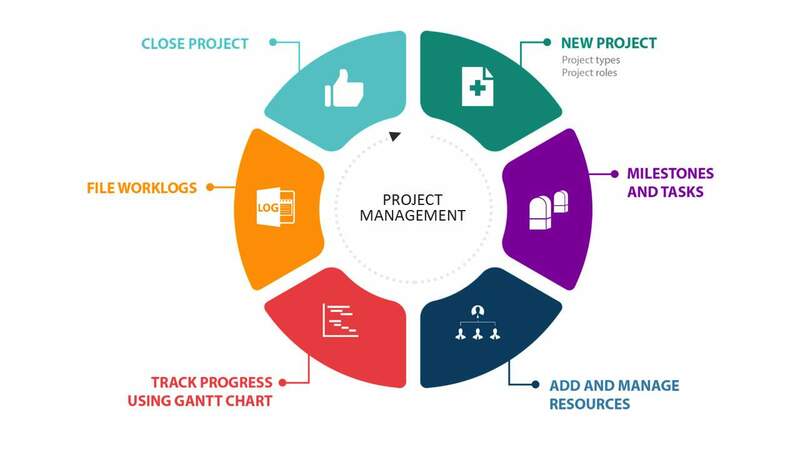 Project management helps identify and manage integration. Helps control project cost: Projects can potentially cost a large amount of money thus managing budgets is a must! Using good project management strategies greatly reduces the overall risk of budget overruns. While it is impossible to control over runs, it certainly helps keep all stake holders focused on the overall financial budgets. Manages risk– Projects always happen in an environment in which nothing is constant except change. Managing risk is a complex and challenging task. It is not optional. Project management helps manage risk. Manages overall quality– Quality is the value of what your team produces. Project management helps identify, manage and control project quality/result. This can essentially help produce a high quality product/service/infrastructure and most importantly a happy customer. Retain and use knowledge– Projects generate knowledge or at least they should in most cases. Knowledge represents a significant asset for any business. Left unmanaged knowledge tends to quickly fade. Project management ensures that knowledge is captured and managed successfully. Learning from project failure– Projects can & unfortunately do fail. When & if this happens, it is imperative to learn from the process. Through project management one can learn the lessons from project management through successes & failures. These are just some of the reasons why project management can help you & your business to succeed. Without proper planning & implementation, valuable lessons can be lost in the process, especially when considering new projects in the future. One more thing, the growth in Project Management roles is expected to grow to over 15 million globally by 2020 across seven project intensive industries. (As quoted by PMI Industry Growth forecasts 2010 to 2020). Another great reason to sign up & learn!